The Barrow Design-Build Camp contributed to my Master of Architecture thesis at the Boston Architectural College, along with a lot of other design and research work completed over the past year and a half in the fields of participatory design and community design-build. My thesis book (embedded above) has finally been polished, printed, signed, and sent off to Boston to sit in its official place in the BAC library. It was truly a labor of love, and so many people along the way contributed to making it interesting, engaging, and successful. Thank you all. In July 2014, I coordinated and led a two-week Design Build Camp in Barrow, Alaska. The focus of the camp was for students to learn design and construction skills, and build teamwork, and to feel a strong sense of accomplishment at what they can do for themselves. Fourteen high school students attended from across the state and worked with me and two other instructors to design and construct mobile community pavilions. The camp donated the shelters they built to the City of Barrow for public use at the village playgrounds. 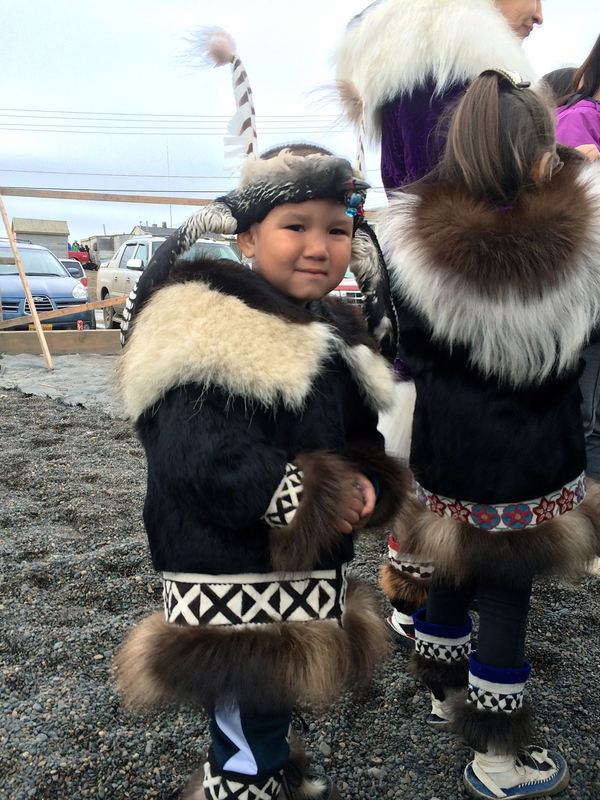 The first four days of camp focused on design, incorporating field trips to the playgrounds for site analysis, gathering design inspiration from guest lectures and around town, and learning from the history and culture of the Inupiaq people in Barrow. The basics of structural design were taught with hands-on practice, and precedents were introduced for mobile architecture, pavilions, arctic structures, and found object design. Each student developed and presented their own conceptual design for a pavilion, represented in drawings, digital models, and physical models. The group then worked to combine the students’ ideas into two structures, pulling aspects from each of their designs. The next week and a half was spent building the structures, learning and using tools and the construction process. The camp culminated in a community presentation and the installation of the pavilions at each of Barrow's two public playgrounds, where they were well-received. The blog posts preceding this detail some of the process leading up to the camp, and journal our exciting day by day activities during the two weeks in Barrow. Check them out! On our last day in Barrow, Milly and I took a bit of time to go back to the playgrounds and photograph the structures in use. The rainy weather meant the playgrounds weren't as full as the day before, but there were still a few kids who were playing about on the structures. On A.C., the were mostly on the roof, to no one's surprise. Kids in Barrow like to climb on things! Sadie might be a bit harder to climb up on since it isn't near a fence, and the kids love poking their faces in the circle holes. A few kids posed for a picture with me on A.C., and I took detail shots and some video footage at each site. When the rain started coming down heavier later in the day, Milly passed by A.C. on her way to the airport and informed me all the kids were taking shelter inside. So far, the structures seem to have met success! Checking it out on multiple levels. Plaque signed by the creators. Sadie fits in well with her surroundings. Checking out the new structure. The sun came out for a brief moment and filtered in the holes. Whales tale and donation plaque. Rob made two fantastic videos for our camp, one a storyline of our process and the other a timelapse of the progress. Check them out here! Yesterday was an exciting day! We put the final touches on the structures in the morning, painting the detail on Sadie, adding trim here and there to both structures, and installing our plaques. Dennis screws in some trim board on Sadie. Evelyn paints Barrow Whalers colors - blue, yellow, and white. Kirsten paints a fur ruff around one of the circle windows while April peeks through. The ruff windows were a hit with all the students before we even pulled the structures outside! After lunch, we focused on getting our shop ship shape and had a brief afternoon break to listen to the middle school Earth Science campers present the work from their week. Nick stayed behind to help the Ilisagvik maintenance team move the shelters out of the shop, and we all came over to set up the student models and drawings for presentations. We had a pretty good turnout in the audience while the students presented their individual work and talked about what they learned from building the structures. We watched the excellent movie Rob made about the camp (link to be posted soon), and then brought everyone out for a tour of the structures and some photo ops. Mike P. and Geoffrey make a few final adjustments to the base of A.C.
Middle school campers play around on Sadie. After the presentation, it was moving time! With A.C. loaded onto the forklift and some confusion by the drivers as to which playground it was going to, a caravan started down the road toward the playground, following our slow moving structure. A.C. loaded up and ready to go. The proud and happy team! A few of us worked to level out our spot at the playground while waiting for the loader to arrive. The park was full of kids and a few parents, curious about what was happening. The loader maneuvered between basketball hoops and play structures, and with a little finessing and teamwork, we got A.C. in place. The excited local kids jumped on the structure almost before we got it off the forks! Dennis smooths the ground where the structure will be installed. The interested crowd swarms the pavilion. The loader went back for round two while the rest of us headed to the second site to prep the ground. It was colder, windy, and mostly empty, but the few people at the playground were excited to hear what was coming. A woman there with her grandchildren was almost in disbelief and after the structure was installed, she spent time talking with all the students, congratulating them on their hard work. The loader carries Sadie down the road toward the park. Students pose with their work for onlookers photo ops. Installations successful, we finished our day with a well-deserved party. Most of the college staff was there, as well as some community members, and all the middle school students from the Earth Science camp as well. We enjoyed food prepared by Simon and Tenna and built a raging bonfire to roast marshmallows. Many brave souls took a celebratory plunge in the Arctic Ocean to cap off the evening. Dennis contemplates the cold water before diving down. Frank, Yvonne, and Evelyn make the plunge. Yesterday was such a busy day I didn't have time to get a post up! We did a lot of finishing work, including stretching canvas on the wall and roof of A.C., building our final wall, painting and staining, building benches, making plaques, and adding baleen and metal accents for a creative and cultural final design touch. Today will be a half day adding the final polish, and this afternoon we have a presentation and celebration for the college and the community. Our final challenge will be moving the structures to the locations at the playgrounds, with the help of the college maintenance department and the City of Barrow recreation department. When our structures are securely in place tonight, we'll celebrate with a bonfire on the beach for the students and all their hard work! Lena puts a coat of finish on a plaque for each structure. Milly helps Anu and Geoffrey position baleen over the doorway of A.C.
Mike P. and Geoffrey install baleen trim on A.C.
Stretching canvas over the ribs, like skins on an umiaq (skin boat). Dennis and Branham take a break on the bench they built. Kirsten and Joe work on finishing a bench. Proud of my students work, hanging out in Sadie. Posing proudly under the baleen in A.C.
Marina, Evelyn, and Kirsten came in late to paint the plaques and pose for some pictures. Today was a great day full of visitors, good progress, and plenty of silliness! We framed up most of the walls, cut fun circle holes in them, installed the curved roof rafters, the metal roofing, and blocking at the eaves, and cut and installed the curved wall ribs for the shelter we are calling A.C. After a week and a half of learning and being together, we're beginning to work more smoothly as a team, with students carrying their tasks through much more autonomously. All the visitors who stop by to see our progress are very impressed. Joe, Geoffrey, and Anu prep the roof to install standing seam metal. Mike P. grinds a joist hanger. Kirsten, Milly, and Marina work to cut the curved ribs for the wall of A.C.
Misha, Branham, and Evelyn pose happily with the wall they framed and cut portholes into. Geoffrey and Dennis help Nick cut scrap metal we found on the beach that will make an interesting detail on Sadie's walls. Walls framed and circle windows cut. Among our visitors today were a few V.I.P.s. Pearl Brower, the president of Ilisagvik College, came by to meet the students, see what they've been up to, and discuss with them the possibilities for their future. A little while later, we were surprised by a visit from Bob Harcharek, the Mayor of the City of Barrow, and his son Nagruk, who has been very helpful in obtaining donations of supplies. All were pleased with the structure designs and construction and impressed with the work the students have done in just a few days. The whole team poses with Nagruk and Bob Harcharek. We were all particularly focused in the afternoon, perhaps driven by the realization that we need to be finished in less than two days (a fact we reinforced in a pep-talk after lunch). There was still time for a little silliness and posing for some pictures though! Dennis and MIke P. checking out their pictures. Joe found the perfect pair of work gloves. Billy tests the strength of the beam with a self-engineered swing. A lot was accomplished today! A few of us woke up bright and early for a special field trip - we went with Tennessee down to the radio station, KBRW, to talk about the camp and the pavilions we are building. Four students came along and had fun answering Bob's questions about their experiences. We hope the radio spot will help spread the word about our project and get some community members to come out to our celebration on Friday. Bob, the announcer, talks with Lena about why she came to Design Build Camp. Billy jokes on the air. Today's work tasks were focused on getting the roofs up on the structures. We had two more columns to install, then we put some time into bracing things off to make sure the structures were square and plumb. Most of the morning was spent cutting, layout out, and installing the rafters for the main roof sections. In the afternoon, the sheathing and waterproofing went on, we framed in a wall, and a few took on the challenging task of making a curved rafter for the smaller roof sections. Kirsten shows her pride for her work. April and I put a beam into place. We had another exciting moment this morning when our client stopped by. Christopher Battle with the City of Barrow recreation department came over to check out the progress and was very impressed and excited by the work we've done. Jeremy Goodwin, also with the City, should be coming by soon to plan the logistics of moving the structures to the playgrounds where we can anchor them in place. Chris talks with Milly about the structure design. Laying out the rafter spacing for the roof. Misha and Kirsten get ready to install a joist hanger. Geoffrey grinds off the tops of the joist hangers, since the only ones available were too long for our beams. Milly and April look on while Marina cuts along their curved rafter lines. Geoffrey takes a break and gets a bird's eye view. Progress shot at the end of the day. Looking a lot like shelters! We took Sunday off to recharge our collective batteries (mostly; a few kids wanted to work so we added a beam to the middle of each sled base). Students spent most of the afternoon lounging and we had a teacher outing back to the traditional room at the museum, the fur shop, and the Top of the World Hotel restaurant. Today we were back to the normal schedule, and kicked off first thing with a design discussion. We had several options for the smaller roof segment of at least one of the pavilions, so we put them to a vote... and the curved option won with nearly unanimous support. This design iteration is for the playground near the coast, the Sadie Neakok Memorial Playground. To keep our designs straight, we're calling this pavilion Sadie. The Chevak crew, tools belts on and ready to work. The main task for the day was to install the columns and beams that will hold our shelter roofs. We used salvaged 4 x 6 lumber to make the posts, deriving our height dimensions from the constraints of the found pieces. After cutting notches in each post, a lot of sanding and filing was done to each one to turn the rough wood into something that looks good and won't give kids splinters. Working out column dimensions on the white board. April and Evelyn sand our salvaged posts prior to installation. Mike O. takes a turn on the radial arm saw. First beam goes up! Dennis and Nick stabilize while Joe screws it in place. Geoffrey whistles while he works. Joe and Geoffrey work together to install a beam. Misha and Branham apply a coat of clear finish to the installed beam. 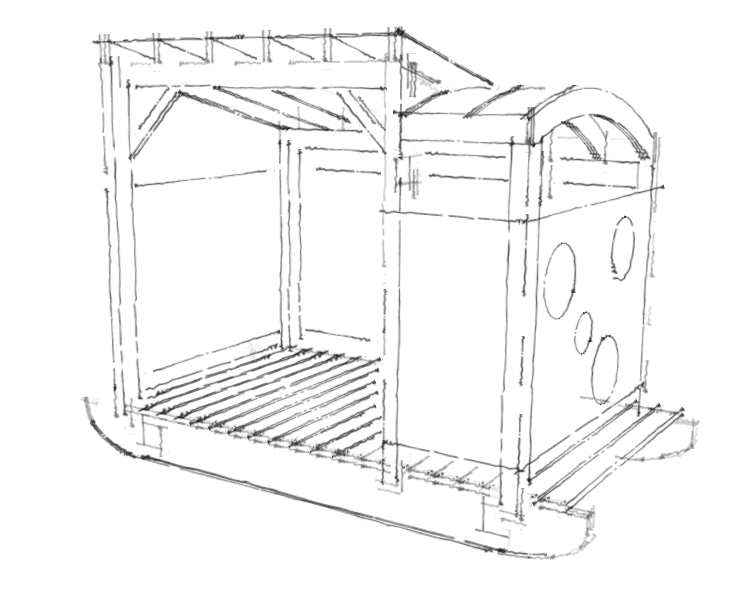 While most of the crew worked on the columns and beams, a few did some design work, brainstorming ideas for the benches that will go inside the structures. I also took a few students with me to gather some more donated materials. We stopped by the mayor's house to get a few additional sheets of plywood, and then went by the City of Barrow shop for some metal roofing that came off a newly-remodeled building. The roofing was too long to fit on our truck, so the City kindly delivered it - which gave the four workers a chance to check out our progress. We actually had quite a few visitors stopping by the shop today, and all were impressed with the quality of the work so far! Lena, April, and Milly work on bench design ideas. Saturday after Independence Day meant we let the students (and ourselves) sleep in... but just a little bit. Breakfast is served 7.30 - 8.30 here, so if we wanted to eat we had to get up. Some campers went back to sleep, but everyone managed to be ready for action by 10. We put in some good work before lunch, then took a break to go back to the Fourth of July games downtown. A couple of students took home some prize money! Our afternoon was very productive, as we finished the sled bases! Getting the spreaders installed took some effort, but teamwork got the job done. The sleds look great! In addition, we prepped and cut columns from salvaged wood and made progress on the design concept, incorporating everyone's ideas together in two variations on the basic form. Nick demonstrates the proper technique for attaching the sled runner to the ski. Joe strikes a pose while prepping the holes for the spreader bolts. Branham and Dennis countersink holes prior to screwing down the sled runners. Evelyn and Lena apply ice and water shield to the top of each ski for moisture protection. Branham, Misha, and Evelyn prep scavenged boards for use as columns by pulling out rusty nails and staples. Nick gives a lesson on using a skilsaw to trim up the deck boards on the sled. Mike P., Geoffrey, and Billy work on screwing the deck on the second sled base. April, Lena, Kirsten, Marina, Billy, and Joe pose proudly with their finished sled base. Instructor pic - proud of our students work! Concept sketches in progress - incorporating student ideas to modify a basic form. We started the day with the whole group in the shop, working together to finish the cutting, drilling, and bolting of the four skis that will support our base. We finished the skis with a coat of clear stain, to provide some waterproofing, and left them to dry so they will be ready for installing the sled runners tomorrow morning. Finished skis await installation of the plastic sled runners. After a late brunch, we headed downtown for the Barrow Independence Day celebrations, which included a parade, games, a 'marathon' (actually six miles for women and nine for men), the Miss Top of the World pageant, and all manner of food, prizes, and people. Some of the students participated in the gunnysack race and won cash when they placed in the top three. Anu, evening counselor Frank, and I all raced in the marathon, and all of us placed! Lots of fun had by all. Parade float, with passengers throwing candy to the crowds. Silly celebratory style.... fake 'staches and freedom shades! The beach next to the games area was lively in the warmest sun we've had yet in Barrow, so we headed down to check it out. Despite the ice floating just offshore, a few of us were inspired to jump in and give the polar bear plunge a try. Refreshing! Nick returning from his icy bath. Geoffrey and I take our turn swimming out to touch the ice. Our evening culminated in attending the Eskimo dancing event at the elementary school. Every age group got a chance to come to the floor and dance to the rhythm of the drums. It was an excellent end to a great day celebrating America, Alaska, and the wonderful diversity of culture they contain. Woke up to thick fog, which hung around the college most of the day. After breakfast and our daily morning games and stretching, the students spent an hour adding the final touches to their models and drawings, then set them up in the shop for presentations. Just before we started, as if on cue, Masaak showed up with a beautiful model dogsled his son made from caribou jaw bones and other traditional materials. Milly discusses the attributes of Billy's design with the group. Misha explains her roof design concept. Mike P. talks about his shelter design concept. After excellent presentations by all and some discussion about the designs, we were faced with a difficult task - how to take thirteen different concepts and begin to narrow them down to a set of design principles for the two structures we are beginning to build. We brainstormed as a team and came up with a list of characteristics the structures will need to share. Each person discussed the individual feature they thought was most suitable, from the entire group of designs, and we created a dichotomy, grouping the features to form two different concepts. About one third the class was interested in creating a more curvilinear, stage-like, mostly open shelter, while two-thirds were leaning towards a more rectilinear, more enclosed hang-out space. As the students broke for lunch, we had a teacher meeting (one of many daily) to come up with a plan for keeping the designs constructable in our limited time frame. We chose a basic form that was common to many of the students' concepts, leaving room to incorporate the more organic and complex design features through non-structural portions of the shelter. In the afternoon, we headed to the computer lab to introduce digital modeling through SketchUp. The students were each given a flash drive with the sled base pre-modeled and we walked through modeling the columns that would support the roof. For the latter part of the afternoon, half the group split off and went back to the shop, completing one ski for our sled bases, and prepping the baleen for soaking. Milly and I worked with the group in the SketchUp lab to develop the basic form we had chosen into more detailed models. Marina shows off her SketchUp skills. In the evening, we watched videos made by students at the college, and celebrated the birthday of one of our students with a cake made by Tennessee. Happy birthday, Evelyn! The fog lifted slightly in the evening and the sun started poking through... hoping for a beautiful day tomorrow as we celebrate the Fourth of July in the northernmost city in the USA! The students spent the morning hard at work continuing their progress from yesterday, focused on developing their ideas for the playground shelters by crafting their wood and cardboard models and their trace paper drawings. The shop was quite a center of design productivity! Anu and Branham work together to test the accuracy of their scale models. Marina cuts structural ribs from cardboard. We worked hard until late morning, took a brief break (with donuts from Rob), and then walked around the NARL facility discussing the various structural conditions we could see, observing post and beam constructions, trusses, space frames, rafters, and all manner of bracing (or what happens when there is none). The students got back to work on their models while Rob and I tagged tools with their names in Inupiaq for practice. Helping Mike O. make a barrel vaulted roof by scoring materials. April's finely crafted shelter frames. After lunch, we divided into two groups. One continued to work on their drawings and models, while the second got geared up with safety equipment, tool belts, and typical carpenter tools for their first construction lessons with Nick. They started by learning to measure and cut with the radial arm saw, and practiced drilling and cutting with a jig saw to create the first of our sled base skis. Construction begins! Half the team gets decked out in their tool belts for their first tool use and safety lessons. Dennis using a jig saw to cut holes for a forklift in the first ski, while Rob, Anu, Billy, and Mike O. look on. In the late afternoon we were treated to a guest presentation. Billy's aunt, Roberta Leavitt, came by to talk to us about traditional skin boats and how she and her crew make the threads from caribou sinew and sew the boat covers from seal skins, sometimes working for more than 24 hours straight. She showed photos and was wonderful to listen to, teaching not only about her craft but about her values, how a good heart and respectful behavior lead the whales to give themselves to the hunters to feed the community. We gave Roberta a camp t-shirt and brought her to the shop to show her our work so far. When we mentioned to her that we were hoping to try to use traditional materials in the design, if we could obtain them somehow, she generously offered to donate four large chunks of baleen to the project. Billy, Rob, and I went to her house to pick it up, and she and her husband showed us more of the traditional tools they make and use. Roberta tells Rob and Billy about the homemade harpoon, which is smaller than typical because it was made for one of her young grandsons. Baleen! We've got our work cut out for us preparing this for use on the structures. The first step is soaking it in salt water for about a week. Another busy day behind us! Today was all about gathering inspiration for our designs from the environment and culture around us. After breakfast, two rounds of seated basketball, and a discussion on the historic architecture each student has seen in their home villages, we piled into the van and headed to the Inupiat Heritage Center. The museum guides and archaeology staff gave us an excellent tour, including a behind-the-scenes peak at their storeroom and the collections they have yet to document. The museum focuses on the whaling culture and gave us insight into the design of the tools and structures that make whaling possible. In particular, we were interested in the umiaq, or skin boat frame, the tents the crews use when they are camped out on the ice waiting for whales, and the qargi, a traditional communal structure. Our tour guide explains a typical whaling camp tent structure. We also got a chance to visit the traditional room at the museum, where several artisans spend their day creating beautiful artwork from tusk ivory, whale bone, baleen, and other traditional materials. The students were all excited to see the amazing work of the artists and were able to ask questions about their process turning raw materials into art. After the workshop visit, our guides taught us to say the names of tools and materials we will be using in Inupiaq. We'll be practicing while we work! Buckets of baleen await use in the traditional room workshop. Nick snapped this shot of knives (savik) and tools (savalgutit) made with bone and antler handles. Kirsten, Mike O., and Marina talk with our guide and an artist about his craft. Kirsten sketches a walrus slide while Marina poses for a picture. After documenting our site, we stopped by a couple of points on the coast to see the location of some historic sod houses similar to ones we had studied in an earlier lecture. All that remains of these ancient homes are some mounds of tundra poking up from the rest, but the landscape around Barrow makes it not so difficult to imagine what it might have been like before the cars and powerlines of modernity came onto the scene. Ancient sod hut in the foreground, modern day structures in the back. Our final field trip of the day was to travel north of Barrow to the cabins at Pigniq. Masaak, the shuttle driver, came with us and gave us the inside scoop, since he owns a couple of cabins in the camp. He told tales of growing up in the small cabin his family still owns, and we all chose a cabin to sketch, observing for each of them orientation, window and door placement, roof structure, and foundation design. Masaak talks of earlier times in duck camp while Mike O., Kirsten, and Evelyn listen in. Umiaq and typical cabin at Pigniq. Once back in the classroom, we spent the remainder of the afternoon with a structures lesson and 'studio time' - beginning to brainstorm, draw, and model ideas for the playground shelters. Marina, Mike O., Joe, and Mike P. demonstrate how tension works while Milly explains. Ideas were beginning to take shape as we left the shop / studio for the night... looking forward to seeing the progress tomorrow! Woke up to overcast skies, pouring rain, and the kitchen opening late for breakfast, but after a slightly late start to class we got our spirits and energy up with some fun get-to-know-each-other games. We cracked open our new sketchbooks with speed drawing portraits of each other and discussed the subjectivity of design by analyzing all of our shoes. We rounded out the morning with a tour of the shop and introduction to our tools. After lunch, Milly led the charge teaching the students about hand drafting and the tools architects use. Everyone practiced using a scale and drawing in plan and elevation while Nick and I met with the guys at Umiaq to round up some more supplies. We then began our junkyard blitz build challenge. In three teams of five, each team was given a set palette of materials: some lumber, a pallet, rebar, rope, and miscellaneous constructed objects. They had 45 minutes to brainstorm and work together to build something functional, using no fasteners but the rope. After some initial hesitation, the groups got rolling, producing a boat, a shelter, and a fish drying rack plus chopping table. Evelyn, Joe, Branham, and Mike O. get started on their fish rack. Ben, Geoffrey, Anu, and Mike P. work to stabilize their post and beam construction. Team Three contemplate their structure with one minute left in the challenge. After the final touches were made to the structures, each group presented the function of their construction and explained the most crucial structural support members and how they made them work. And of course, they posed for some pictures. Team One poses on their sailing craft. She might not be seaworthy, but securing the cross pieces to the mast with nothing but rope was a great achievement. Team Two are all smiles hanging out in their sturdy shelter. The ridge beam they lashed in place successfully supported the weight of two of them standing on top of it! Team Three pose for their album cover... I mean show off their fish rack and cutting table fabrications. In the late afternoon, we headed to the Barrow playground, one of our site locations. We discussed site analysis and the students mapped out the scene in their sketchbooks, making observations about the activity and environment while beginning to think about where they will site the structure and what they might build. Marina and Mike O. sketching at the site. NIck, Branham, Kristen, and Evelyn mapping and making observations at the playground. The glorious Arctic sun came out while we were at the playground and it's still shining bright at nearly midnight. We accomplished a lot of learning today and we're ready to charge up for another jam-packed day tomorrow! We had a low-key morning at Ilisagvik, with most of the students sleeping in until Sunday brunch at 11:30. The day outside was beautiful, so we loaded up the van and headed out to check out the cabins at Pigniq, the duck camp which usually marks the last point where a car can safely travel. But the road was open beyond the cabins, so we drove as far as we could and then walked towards the northernmost point of land in America. Nick and Anu skipping stones from the sea ice. We all beachcombed as we walked towards the point and there was a lot to find. Among the treasures we collected were bones (large and small), eggs. beautiful rocks, beach glass, a dog toy, and even a message in a bottle! Our afternoon adventure gave us a great chance to take in the environment outside Barrow as we prepare to design for the town. Anu and Branham tried their egg-toss skills with one of the ones from the nest. Checking out the message in a bottle. It originated in Barrow a year and a half ago, and clearly didn't make it far. We plan to add to it at the end of camp and send it back out for take two! Nick, Milly, and I safely arrived in Barrow to overcast and chilly weather but high spirits. We connected with the Ilisagvik team and spent the early afternoon going through our tools and organizing the shop. Almost everything is accounted for, just missing a few metal plates for the ski base design. Plenty of time to find them. The tools look great and there are plenty for all our students. Getting excited to build! Later in the afternoon, we went downtown to check out the nalukataq festival - the celebration of a successful harvest when the whaling captains distribute whale meat, muktuq, eskimo ice cream, and other delicacies for a community-wide feast. In the evening, some of our campers arrived and we all went back to the festival to watch the blanket toss, a joyful and fun event. The celebration was an opportunity for everyone to come out in their finest parkas and for all who wanted to try their jump skills on the blanket. The clearer weather means the crowd will probably be celebrating with traditional dances well into the wee hours of the morning. Some jumpers added color and excitement by tossing bags of candy while in the air, adding an extra aspect to coordinate during an already tricky maneuver. It's been an incredible first day! Our team of three teachers hails from various parts of the country. We are all thrilled to be starting our adventure of teaching design-build in Barrow! Check out below for a little bit of info on our team members. Skye Sturm is an architect in Fairbanks, Alaska, working in a design firm while pursuing her Master of Architecture degree at the Boston Architectural College. Her thesis focuses on engaging community in the design-build process. Born and raised in Fairbanks, Skye has always had an interest in exploring and building in Alaska's more remote places. She has picked up construction experience to complement her design background by working on projects such as historic restoration in Wrangell St. Elias National Park and the Fortymile River area, as well as the design and construction of sustainable student housing at the University of Alaska Fairbanks. When she's not designing or building, Skye likes to spend time outside with her partner and their two huskies. Milly Baker is an architect living in Boston, where she has been since graduating from the University of Oregon in the '80s. She is originally from New Jersey and upstate NY. Milly has been working as a licensed architect for many years, working in two large firms with a lot of expertise in hospital design. She has worked on projects all over the world, and is excited to be making the journey north to join the Design & Build camp team. Visiting the Top of the World city has been one of Milly's lifelong dreams. Milly brings her expertise in design education as well as architecture. She has a 14 1/2 year old dog named Zeke who she will miss a lot while she is gone. Nick Toye grew up in Laramie, WY and moved to Valdez, AK in 2002. He graduated from UAF with a B.A. in Geography of the Circumpolar North and Pacific Rim with a minor in Geology/G.I.S. He began working in the construction trades during school and some years off, working for a general contractor in Valdez for a couple years and on housing projects in Anchorage, Girdwood, Valdez and Fairbanks. He has worked for the Cold Climate Housing Research Center in Fairbanks and traveled to various remote villages for prototype housing projects; Buckland and Atmautluak, AK. He recently returned to Alaska from a winter in Wyoming building houses and formed his own contracting company, Boreal Builders, based in Anchorage. Prep has been underway for months now for the Barrow Design Build Camp, and the action starts this weekend! Heading to Barrow Saturday to get settled and check that all our tools and supplies are in place and ready to go. Here are a few images from the latest progress - important details like pre-fab spreaders and camp t-shirts! Jon from Jon's Machine Shop in Fairbanks fabricated these spreaders for our module skis. 5'-4" long, they just barely squished into my car for transport to Northern Air Cargo for shipping! Nomadic Stars in Fairbanks is underway on t-shirt production, using their friendly, organic inks to make our cool design. Our final presentation for Thesis I is one week away. A progress post on my recent design work is below. These are two concepts for a total of three different module types.